Northern bottlenose whales live in cool and subarctic waters of the North Atlantic Ocean. These whales were extensively hunted for over one hundred years, and their current numbers are very likely much less than the pre-whaling population size. As other species of the beaked whale group, Northern bottlenose whales are found in submarine canyons that are often targets for the offshore oil and gas industry, as the porous, coarse-grained rocks they contain make ideal hydrocarbon reservoirs. This industry uses powerful sound sources during seismic surveys to assess the presence of oil and gas reserves. Intense sounds from these surveys have been associated with hearing damage for some marine species, as well as causing them to avoid areas of preferred habitat. Beaked whales, in particular, appear to be extra sensitive to acoustic disturbance, but other species like pilot whales and sperm whales that also share the deep waters of the continental shelf edge and submarine canyons, can potentially be impacted by seismic surveys. 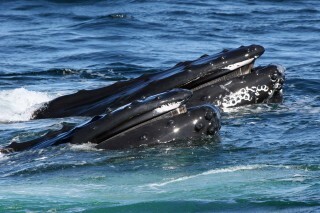 One of the locations where this species can be found, is the Gully of Nova Scotia, Canada, where Dr. Hal Whitehead from Dalhousie University and his students have been studying these whales for decades. Years ago, I participated in one of the Gully research cruises and skippered the sailing yacht, Balaena, that Whitehead uses as a research platform. We spent several weeks sailing in the Gully photographing whales to identify individuals, and using a towed hydrophone to detect the sounds they made during foraging dives to over 3,000 feet. Occasionally, the whales would approach and circle our boat. I couldn’t stop thinking about who was watching who. It was during one of these close encounters that I snapped this image. Luckily, for the whales in the Gully, this area has been designated a marine protected area. While it is a good example of measures that can protect deep water ecosystems, the majority of the world’s submarine canyons, and the marine life that call it home, still remain unprotected and in need of additional conservation efforts. 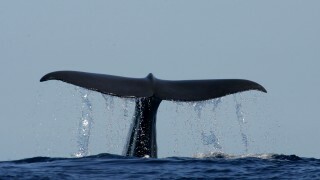 See Deep Water Whales, Part 1.